Microsoft is ending support for Minecraft on Apple TV. The app arrived on the device two years ago and cost £20 in the UK. In an on-screen message to players the firm said it was "reallocating resources" to more popular platforms, and while the game would work on the device, it would refund purchases made within the last 90 days. Players began being alerted on 24 September. Apple and Microsoft have been contacted for comment. New copies of the game can no longer be purchased from the set-top box's app store. 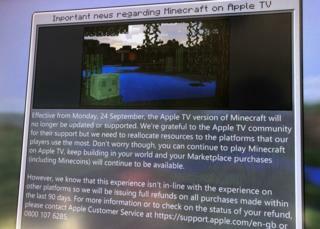 Apple fan Nathan Burlton tweeted a picture of the message from Minecraft when his 10-year-old son tried to load the game on his Apple TV at the weekend. "He doesn't play on it very often," he said. "Occasionally when friends are around we would use it on the Apple TV with someone playing on the TV and a few others on iPads. It was useful in that regard." The family prefer to play Minecraft on tablets, he added. Set-top boxes have struggled to attract mass audiences to their games offerings despite many being made available on devices like the Apple TV, Amazon's Firestick and Google's Android TV. In an interview with Fast Company last year, games publisher Raw Fury said in the first five months of the launch of its game Kingdom: New Lands, it had sold 54,000 units of the iOS version, 35,000 of the XBox One version and 600 on Apple TV. Commenting on the decision about Minecraft, analyst Ed Barton from Ovum told the BBC that Apple TV was unlikely to be a big platform for it. "We wouldn't assume Apple TV would be the primary device that most Minecraft players are using but for the people who are playing it, it may be their only way of playing it on their big TV," he said. "Set-top boxes haven't blown the lights out of the gaming world – their primary purpose is to watch stuff on, not play stuff on. "But TV devices are ideal to stream games to in the future."